Wooden Radio Jukebox is a powerful radio jukebox combination with traditional knob dial, in high sensitivity AM/FM receiver, USB/ SD/ MMC Card player and two unique audio output to play absolutely wonderful music, in a mini handmade wooden cabinet design for practically portable. 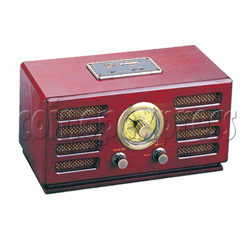 This nostalgic jukebox transfer stably radio sound and cool external music effect, is great for game room, bar, pub, nightclub or home living room. Factory requests $120usd for handling charges of sample order, this cost will be refunded fully while customer place formal order.